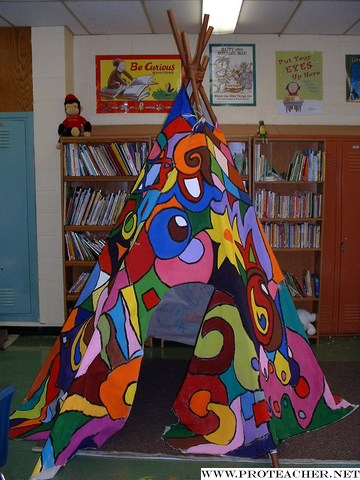 This reading tipi was designed to be a quiet place for students to read and write. At times, a child who is easily distracted will go to the tipi to complete his work. At other times a group of up to eight children will join me in the tipi for reading. The tipi was made with long poles, a canvas drop cloth and rope. The design was drawn and then painted with acrylic paint. The tipi can be folded up for storage. There are large pillows on the floor which make this a very cozy, fun place to read.